Beer vs wine at Savour Kilkenny 2014. Pic courtesy of Ken Maguire. Looking for something to do this weekend? 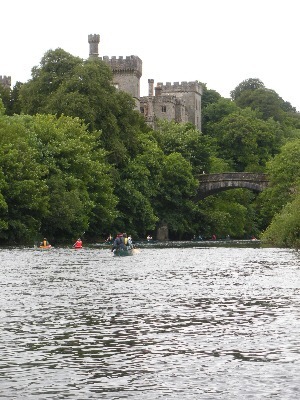 You might be interested in two festivals taking place, one in Kilkenny, the other in Wexford. What goes best with food? Beer and cider aficionados would say – of course! – local beer and ciders; wine pros would argue that wine is the better match. There’s only one way of finding out! Join us for tastings of local food, each matched with a particular beer or cider and a wine. Le Caveau’s Colm McCan talks wine, Sláinte author Caroline Hennessy counters with beer and cider and you decide who is right by voting with your glasses. 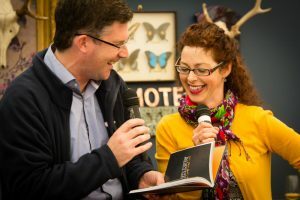 We had a lot of fun at this last year (see Beer vs wine at Savour Kilkenny: a draw?) and the gloves are off for 2015! Keep an eye on Twitter – Colm, Pascal from Le Caveau and I are already getting into the mood. This is part of the Banter at Savour Kilkenny strand, which is curated by Jim Carroll. If you’re not going to be able to make it to Kilkenny, the 64th Wexford Festival Opera started last night and runs until 1 November. If you’re not going to be in Kilkenny – and why not?! – it’s well worth checking out the programme. Sometimes you might even find something food related. And it’s not that I’m obsessed with food (or beer). Well, not for at least a half hour after breakfast every day. Just to show you that I am a well-rounded person, with lots of other interests, here’s a piece I did for Lyric FM’s Culture File back in 2010 on a production at that year’s festival. I did, I have to say, manage to get some food into opera; The Golden Ticket was an opera based on Roald Dahl’s Charlie and the Chocolate Factory. I had the pleasure of attending the European premiere of show and I spoke to conductor Tim Redmond about translating Dahl’s classic into an opera format. All information is at Wexford Festival Opera. Just go looking for the food. You can find it in the strangest of places.